The Callanish Stones were erected in the late Neolithic era. They are an arrangement of standing stones placed in a cruciform pattern with a central stone circle 13 metres (43 feet) in diameter, situated near the village of Callanish on the west coast of Lewis in the Outer Hebrides, Scotland. Image credit: Gail Higginbottom & Roger Clay / RCAHMS. The research, published in the Journal of Archaeological Science: Reports, details the use of innovative 2-D and 3-D technology to construct quantitative tests of the patterns of alignment of the standing stones. “Nobody before this has ever statistically determined that a single stone circle was constructed with astronomical phenomena in mind — it was all supposition,” says project leader and University of Adelaide Visiting Research Fellow Dr. Gail Higginbottom, who is also a Visiting Research Fellow at the Australian National University. “This research is finally proof that the ancient Britons connected the Earth to the sky with their earliest standing stones, and that this practice continued in the same way for 2000 years,” says Dr. Higginbottom. 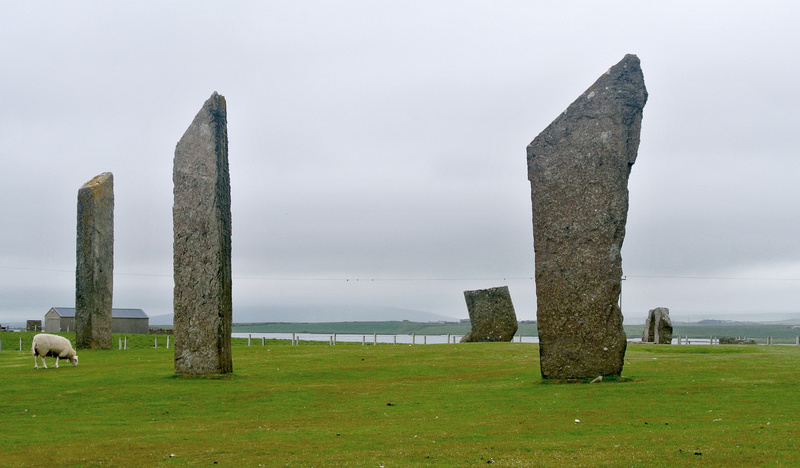 The Standing Stones of Stenness is another Neolithic monument — possibly the oldest henge site in the British Isles — located five miles northeast of Stromness on the mainland of Orkney, Scotland. The stone circle measures 32.2 x 30.6 metres (106 x 100 feet), surrounded by an earthen henge 45 metres (148 feet) in diameter. Image credit: Wikimedia Commons. “For example, at 50 percent of the sites, the northern horizon is relatively higher and closer than the southern and the summer solstice Sun rises out of the highest peak in the north. At the other 50 percent of sites, the southern horizon is higher and closer than the northern, with the winter solstice Sun rising out of these highest horizons. Join one of our guided tours of Stonehenge or Avebury and hear all the new theories.